Alloy Wire is heading to Dusseldorf this week with its largest ever range of exotic Nickel alloys, as demand for intense corrosion properties and high temperature resistance reaches a new high. The UK manufacturer of round, flat, shaped profile and electrical resistance wires will be showcasing more than 50 alloys at ‘Wire Dusseldorf 2016’, including the recently added Nitronic 50 (.001″ to .215″) and Super Duplex (.001″ to .255″). According to the firm, these are ideally suited for the fastener; marine; paper and pulp; petroleum; petrochemical, and oil and gas sectors, and provide a myriad of benefits, including strong corrosion resistance and good mechanical properties at sub-zero temperatures. The major international trade show will also give the company the opportunity to launch its new stand design. The major international trade show will also give the company the opportunity to launch its new stand design and the eagerly awaited 90-page technical brochure, while providing industry delegates with an update on its $1,100,000 investment in new testing capabilities, spooling machines and specialist annealing furnaces. 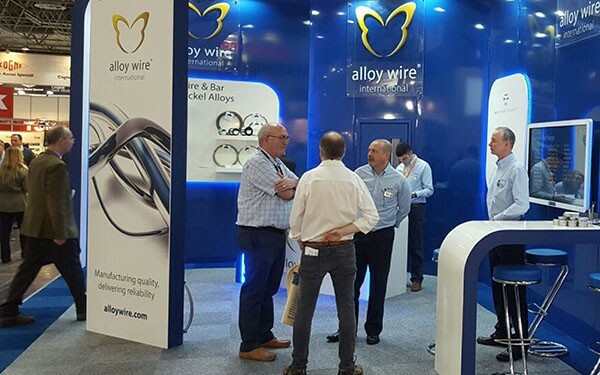 Sales director at Alloy Wire International, Angus Hogarth explained: “Wire Dusseldorf is coming at exactly the right time for our business and gives us a global platform to launch these new products and catch up with clients from all over the world. Alloy Wire, which will be in Hall 11/Stand E26, is celebrating its 70th year in business in 2016. The company has grown into one of the world’s leading providers of wire, supplying 4,000 customers in 15 sectors. An extensive stockholding of materials, ability to provide small batch quantities and 2 week lead times has seen its wire sold to more than 45 countries across the world. Hogarth concluded: “There is a lot of competition in our sector, which is why we are continually looking at the way we service our clients. This could be through technical advice, increasing our range of wire or exploring innovations that can reduce lead times even further.